Fishing boats anchored in the small harbour of Migingo Island. 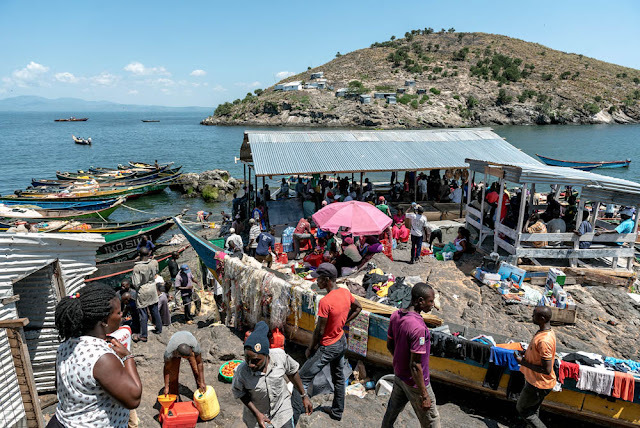 While a boat ride from the Kenyan mainland to Migingo takes two hours, getting from Migingo to Jinja in Uganda takes 18 hours, according to Kenyan fisherman Kennedy Ochieng and Ugandan fisherman Eddison Ouma. 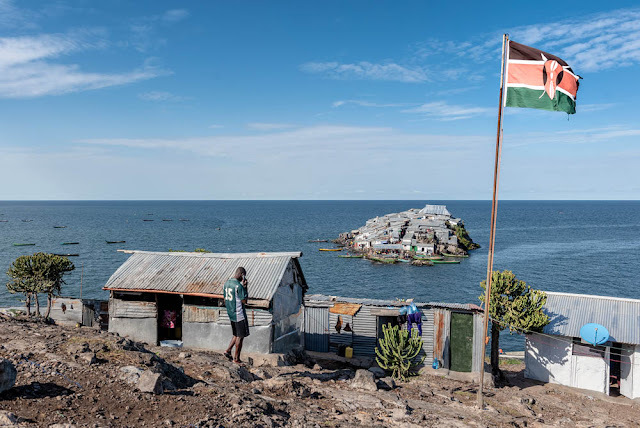 Migingo Island is a ''No-man's island'' between the border of Uganda and Kenya, in the Lake Victoria - a densely populated island that crammed with corrugated metal shacks. Migingo Island covers less than half a football pitch about 2,000-square-metres. The island still engulfed by the low-level territorial dispute between two nations. The waters surrounding it are full of fish. The growing demand for Nile perch fish to the European market and now to Asia have caused more tensions around Migingo Island. The Kenyan politicians recently requested the International Court of Justice to intervene in taking a decision on the political border and ownership. A Kenyan flag flies at Kenyan marine police station on Usingo Island, overlooking Migingo Island. Kenyan police officers tried to raise a Kenyan flag on Migingo in 2018 but the island's Ugandan inhabitants protested against it. The Ugandan security forces pulled the flag down despite an initial agreement for joint policing. 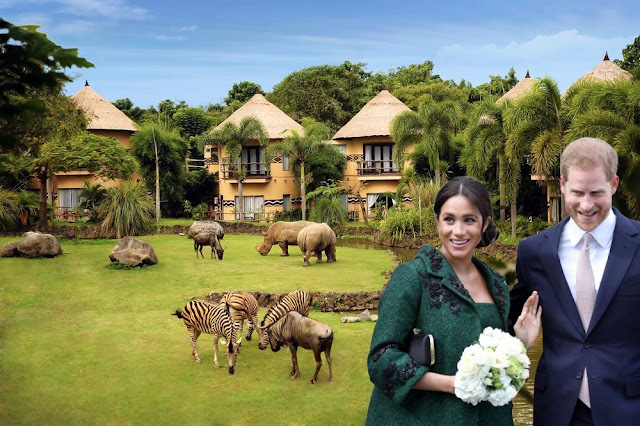 The rock island, with its poorly constructed huts, a tiny port, some bars, a brothel, and an open-air casino, is heavily contested by Kenya and Uganda that both claim ownership. Migingo was little more than a rock jutting out of the water before the lake started receding in the early 1990s, according to Emmanuel Kisiangani, a senior researcher at the Pretoria office of the Institute for Security Studies. 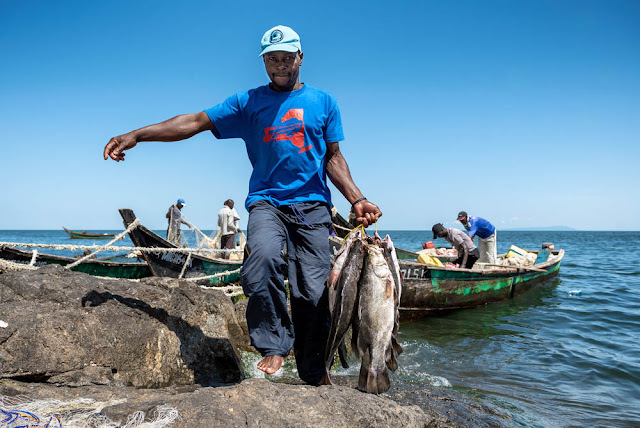 Fish catches have hugely diminished over the years in the fishing communities around Lake Victoria because of overfishing and an invasion of water hyacinth plants that blocked transport on the lake and access to ports. But increasingly profitable species such as the Nile perch are still plentiful in the deep waters surrounding Migingo, making the island a valuable and unique fishing hub. Uganda started to send armed police and marines to Migingo to tax fishermen and offer them protection against pirates in 2004 when the island was still barely inhabited. The freshwater fish has been a profitable export to the European Union for several decades, recently there has been soaring demand from Asia, where the swim bladder from big, adult Nile perch are considered a delicacy. A Kenyan fisherman Kennedy Ochieng, 37, has complained that the Ugandan marine police officers have confiscated his Nile perch about the 300kg after they accused him of fishing illegally in Ugandan waters. Kenyan fishermen around Migingo said Ugandan officers always harassing them, seizing fish and equipment in what they say are Kenyan waters. While the shallow waters where the fish breed is more on the Kenyan side than from the deep waters where fish are more on the Ugandan side. In response, the Kenyan government deployed marines to Migingo in a move that nearly brought the two nations to blows. 'Smallest war' As human settlement began to swell on the rocky island, Kenya and Uganda decided to create a joint committee to determine the border in 2016, relying on maps dating from the 1920s. However, nothing has come from the committee. Many Kenyans go home for the weekend, most Ugandans visit their families only once or twice a year as it takes them 18 hours to reach the Ugandan mainland. The densely populated island also has an open-air makeshift casino and entertainment for the fishermen. Daniel Obadha, 35, a Kenyan electrician who runs a barber shop and phone charging both on the island for the past two years. '''I like to live on Migingo, thanks to the customers coming not only from Kenya but also from Uganda and Tanzania, there is a lot of business and I earn much more money than I did on the mainland,'' he said. 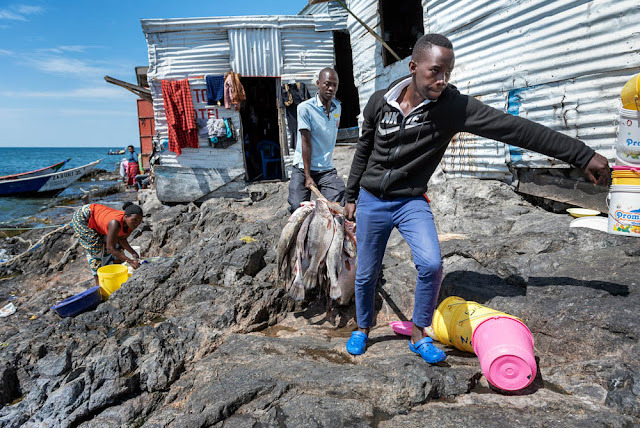 Eddison Ouma, 32, a Ugandan fisherman who lived on Migingo Island for five years and visits his family only twice a year. 'We don't have jobs. That's why we are fishing,' said Ouma, who pays a few fish to the patrolling Ugandan police as a 'protection tax'. Migingo Island also has a tiny clinic where a nurse treats minor issues, like stitching wounds and testing for malaria. However, for bigger medical problems, the inhabitants have to travel to the Kenyan mainland. 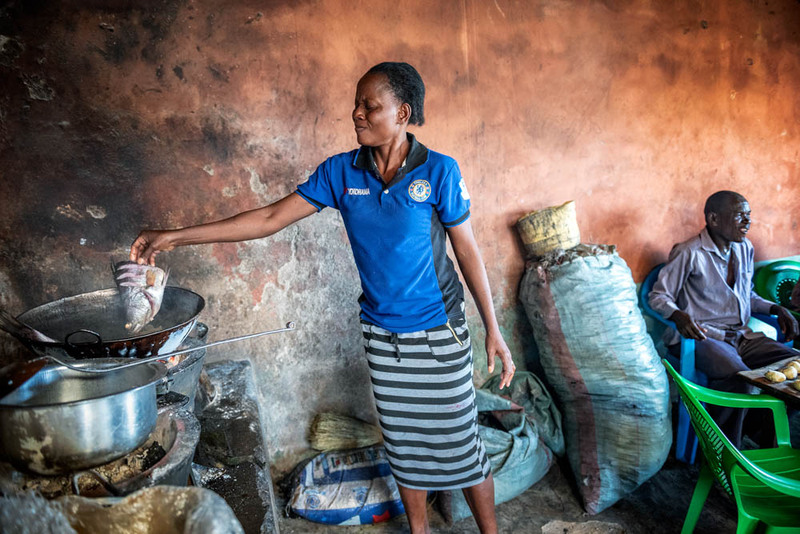 Some women accompany their husband to the island and often work in the little restaurants or kitchens on Migingo. In the meantime, the island is co-managed by both countries but tensions occasionally flare up with some local fishermen calling it Africa's "smallest war". "They haven't decided who owns this island," says Ugandan fisherman Eddison Ouma. "It's no man's land." Thanks to continuing exports to the European Union and soaring demand for Nile perch in Asia, where its swim bladder, also known as fish maws, is considered a delicacy, the large fish has become an even bigger multimillion-dollar export. Prices of Nile perch have increased by 50 percent in the last five years, according to Kenyan fisherman Kennedy Ochieng, with large good quality fish bringing in excess of $300 a kilogram in international markets.